We’re reminding boaters to “clean, drain and dry” – and especially decontaminate — their watercraft and equipment before exiting waters designated as having aquatic invasive species (AIS). This reminder is especially important for out-of-town visitors who moor their boats at AIS-affected waters and are preparing to head out of state. Boaters are required to comply with all AIS regulations of the respective states where they are traveling, as well as those of their final destination. Many states require that watercraft must stop for inspection, which may include both motorized and non-motorized boats. If you see signs that indicate that an inspection station is open, please stop and have your watercraft inspected by the state you in which you are traveling. To ensure a smooth process at inspection stations while traveling home, AZGFD has authorized providers that perform free inspection and decontaminations for those with boats that have been on a quagga mussel-infested waters. 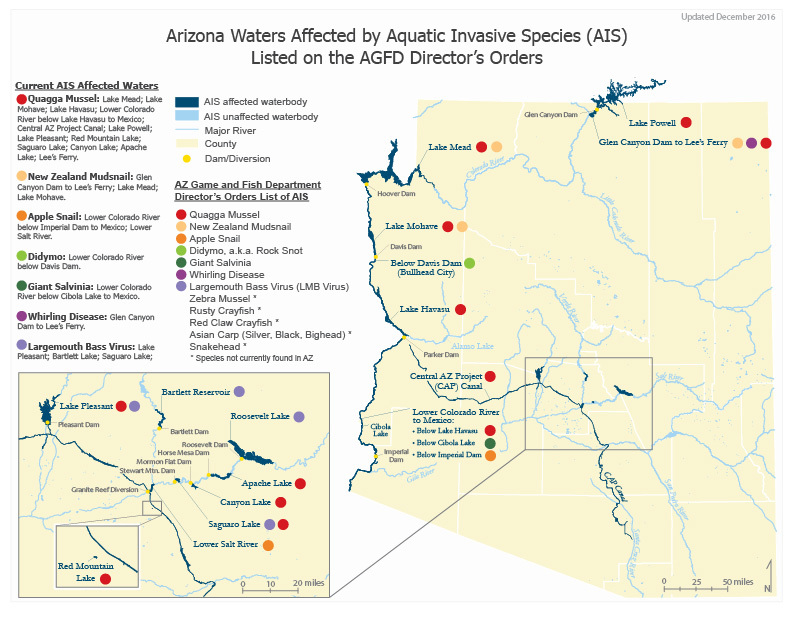 Call the Arizona Game and Fish AIS Program two to three weeks in advance of departure to schedule a free inspection and decontamination at (623) 236-7608. What are aquatic invasive species? 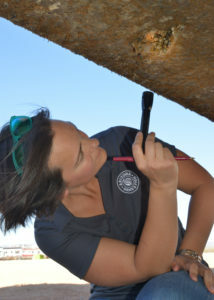 AZGFD aquatic invasive species coordinator Erin Raney inspects a house boat pulled from Lake Pleasant. Aquatic Invasive Species are non-native species that are often unintentionally introduced by human movement. They do not have predators outside of their native range, and are able to outcompete native species. These animals, plants and even pathogens that cause disease in native fish or other aquatic animals can often be invisible to the naked eye, making them even more difficult to control. Once introduced, they can alter ecosystems. Clean boats, waders, anchors, equipment and gear by removing mud, plants, attached animals such as snails. Drain all residual water from engines and motors, ballast tanks, live wells and bait wells. Pull your bilge plug and leave out during transport. Store with boat keys or in a location where you will remember before launch. Dry all equipment that comes in contact with water, such as life jackets, ropes, buoys, tubes, etc. There are additional steps to complete for watercraft that have been on AIS-listed waters for six or more consecutive days. See more information on all statewide decontamination requirements, how to schedule a no-fee decontamination, and the Director’s Orders lists of aquatic invasive species and waters. For interstate travel, be sure to contact your local state AIS authorities for any additional questions on local regulation compliance.